Excited you are joining The 21 Day Green Up Smoothie Challenge! Go here to sign up: The 21 Day Green Up Smoothie Challenge Then I’ll send you a welcome letter with prep guide. Q: What do I need to eat during the challenge? Am I just drinking green smoothies? All you need to do is add 1 green smoothie to your regular routine each day. We aren’t going to take anything away right now, but if you want to up your nutrition game and maximize your efforts, I suggest drinking two green smoothies a day or easing back on the processed foods, caffeine, and dairy. We aren’t overhauling your whole diet right now, so make changes slowly. Q: What blender do I buy? Don’t buy an expensive blender if you have one handy. Dust off the old one in the cupboard. It will do. If you want to purchase one, I suggest the Vitamix. It makes the silkiest, creamiest smoothies ever. This will run you $340-over $600. If you need one that is less expensive, Kitchen Aid and Oster have ones under $100. To avoid any chunks from the greens, I suggest blending your greens and liquid (milk, water) first. Then add the remaining ingredients. Q:Is there ever a “wrong” combination and/or ratio of fruits/veggies when blending? Not really. You can experiment all you want, and you will find out quickly if something doesn’t mix well. Also, try the 3-1 ratio: 3 veggie to one fruit and see if that works for you. Remember you don’t have to follow the recipes to the T. Experiment and you might be pleasantly surprised. Also, if you are allergic to any of the ingredients, feel free to swap out with ones that work for your body. Q: How many calories will I consume with a smoothie? This will all depend on the ingredients. Most smoothies are approximately 150-320 calories. I’m not a numbers gal so counting calories and grams aren’t necessary. It’s more about getting in touch with your body, what works, what doesn’t…this is a step by step process which will benefit you long term. Possibly you will be able to let go of counting calories on the challenge. Q: Is there a correct way to make a smoothie? Q: I don’t have time to make smoothies in the morning before work. What can I do? Try my favorite trick in the book: How to Make a Smoothie Jar (click to read more). Q: How do I store left over smoothies? It’s best to drink your smoothie right after blending, but sometimes life doesn’t make that possible. Try the Smoothie Jar, mason jars and the Blender Bottles to store your smoothies in the fridge. Q: I don’t want to spend a lot of money on produce. How can I save during the challenge? First of all, review your s hopping list before you head to the market. You might have bananas hanging out on the counter or coconut water in the pantry. Go through your list first and you will avoid buying extra produce that might go bad in the fridge (we all hate that limp, brown green stuff in the crisper!). Make sure to check out the Dirty Dozen and the Clean 15 chart or download the free app from the Environmental Working Group site. Buy the ones on the Dirty Dozen organic (apples, strawberries…), the others (avocado,mango…), let go and get conventional. This should help tremendously with your grocery bill. Buy your fruits frozen. As we are coming up on winter for most of us in the Northern Hemisphere, most fruits are out of season. Buy your berries, peaches frozen to save money. Most of all, try to buy local as much as possible. Check out your local farmer’s markets and see if you can score some deals. Q: Which is better, making smoothies or juices? This will all depend on your goal. I recommend doing both each day. Possibly have a juice for light snack and a smoothie for a meal. 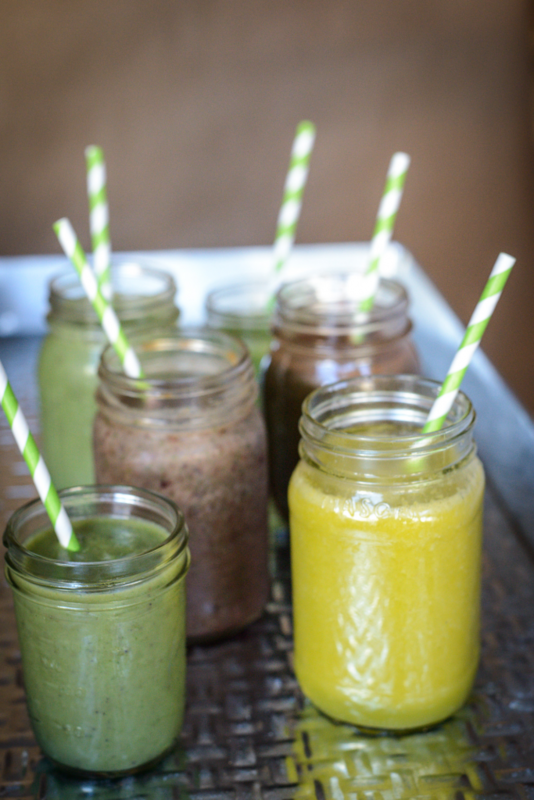 Smoothies are blended so you will get all the fiber from the veggies and leafy greens. Cleanup for blending is easier as there is no pulp, but juicing is easier on your body when it comes to digestion. We are focusing on smoothies for the challenge so try for one smoothie a day to start. If you want more info on juicing, go to: Juice It Up! Q: I feel like I need to add extra protein to my smoothies. Is that okay and what proteins should I add? It is VERY okay to add plant-based proteins to any smoothie recipe. We all need a protein boost once in awhile especially if we are training for an athletic event like a marathon or triathlon. Avoid: dairy (which includes yogurt), whey isolate protein powders and soy protein isolate powders (they are isolated, so very processed; nutrients taken out and additives put back in), and peanut butter or any nut butters that are roasted (hence, processed). All of the above are inflammatory and acidic to your body so we are doing all we can to minimize these items in our routine. Add these proteins instead: hemp, pea, rice, flax protein, gluten-free rolled oats (14 grams of protein for 1/2 cup), and raw nut butters. Vega consists of hemp, pea, saviseed, and rice protein. My favorite is Vega One, the chocolate. I add a scoop to a smoothie after my workouts (15 grams of protein per serving). This isn’t everyday however, but it’s packed with vitamins, probiotics, and super foods so you can replace a multivitamin if you want. Vega’s price can be costly, however. But the research and nutritional value is well worth it. Sunwarrior uses pea and hemp protein and is 15 grams of protein a serving. If you are going for super-creamy smoothies, then this is your product. This protein powder is the REAL deal. You’ll get 17 grams of protein per serving. If you need to know exactly where your ingredients are coming from, this will be best for you. I also use this brand (only comes in one flavor) often and is a staple in my pantry. My kids really dig this brand and it’s easy to slip the Greens into their shakes and smoothies. Packed with tons of veggies, maca (a super food great to support your adrenal glands), and chlorophyll. You’ll get 10 grams of protein per serving. You can buy most plant-based protein powders on Amazon. Experiment and see what you like! The only thing is that some of these add in natural sweeteners like cocoa and stevia so make sure to check labels and decide what is best for you. These powders are processed, even if minimal, but they are processed so keep this in mind. Trick: Not sure if you are getting enough protein? Take your body weight and multiply by .4. You’ll come up with the amount of protein you need in grams each day. So if someone is 100 lbs. (I don’t know anyone that is but let’s just say! ), multiply by .4, and she needs to get at least 40 grams a protein a day. This is approximate and different for each body, but this will help you gauge what’s best for you.